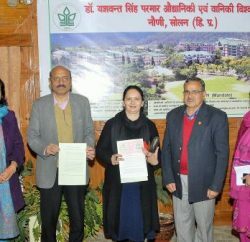 The prestigious Dr YS Parmar University of Horticulture and Forestry, Nauni, is exploring all possible opportunities to facilitate its students with the modern education systems and to equip its students with the superior know-how of natural resources management, it has signed an Memorandum of Understanding (MoU) with Lakehead University, Ontario, Canada, which will facilitate the exchange of scholars between the two educational institutes. 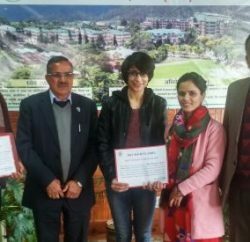 Applicable for a year, according to the terms of the agreement each institution can send four scholars to participate in the programme that will last for four weeks. While the option is available only to registered degree-seekers of the two universities who have completed at least one year of full-time study, they will be expected to promote the programme upon their return. To ensure the optimum benefit to students, a one-to-one mentor will be provided and there will be no additional tuition fee to the host institution. Regular monitoring through weekly reports from the mentor at the host institution will be submitted through e-mail. The scholars will be awarded certificates of accomplishment at the end of the programme. 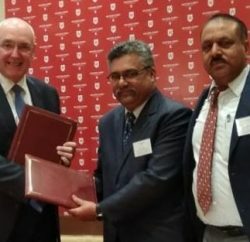 It is also learned that the two institutes also contemplating the extension of the programme and explore the possibility of the degree exchange programme, dual degree programmes, joint collaborative research, joint supervision of PhD candidates, faculty exchange, joint training management development programmes for senior executives, distance/distributed learning programmes, joint professional workshops and funding options for joint research projects, including consultancy, development and revision of curriculum and application of geometrics, including online technologies.